Everyone knows that farmers work hard. And while they do their work, they have great faith in God’s work. Not only do they have great faith, they also have great expectation that the earth will produce the fruit of their labors and that the Lord will bless them with great crops. Here’s the hard part. The farmer does not just sit back and wait. The farmer buys seed, tills the land, plants the seed, irrigates and weeds. After all that’s done, he waits and even expects that God will do His part. Farming. Not a bad metaphor for understanding the way God’s blessings intersect with our responsibilities. So what do you need to do to partner with God this Year? Read more? Forgive more? Give more? Faith, though it may look dormant as it waits upon the Lord, is never passive; it’s never idle; but it is the way of the cross of Christ. • Approved the minutes of the congregational meeting that elected Charles Webb and Jim Lawrence as elders of the class of 2015; and Ron Seery as trustee of the class of 2015. • Gave approval to the Pierian Club to use kitchen and Fellowship Hall the afternoon of December 6th. • Granted permission for a Bone Marrow Registry Drive in Amanda McMillan’s name be conducted at Green Hill Presbyterian Church following worship on January 27th. Sandi DeTora and the church office will provide point of contact. • Heard plans for reorganization of Bible Club from Christian Education committee; the afternoon youth club will now occur on Wednesday evenings during Adult Bible Study and/or programs. • The treasurer reported the largest deficit in the operating fund at this point in the year that he could remember. The church awaits the reception of pledges and offerings to further evaluate the status for this year as well as the composition of the new 2013 budget. • The pastor reported on the latest news from the Fellowship of Presbyterians and plans for joining a cluster of three or four churches for joint worship, sharing of ministry resources, and accountability. These plans are still in their initial stages. • Changed the dates for the next two fifth Sunday healing services to January 13th and March 24th respectively. • Made plans to hold the ordination and installation service of new elders and trustee on Sunday, December 23rd as part of the worship service. Congratulations to Dr. Jim Lawrence and Mr. Charles Webb who were elected to the Elder Class of 2015. Congratulations to Mr. Ron Seery who was elected as the Trustee of the Class of 2015. We know that they are all going to do a fantastic job! The deadline for submissions to the January 2013 church newsletter is Tuesday, December 18. Items can be emailed to greenhillpc@gmail.com or dropped off in the church office. Many thanks to our contributors. Have you been visiting the Green Hill website? If so, you’re certainly not alone. Since the site launched last spring, we’ve had nearly 5000 hits! The majority of the clicks are from the USA, but the rest have come from 42 different countries around the world! We’re getting visits from places like Pakistan, India, and the Republic of Korea! It certainly is a small world! As all of you know, Amanda McMillan is in the fight of her life against Leukemia. This extended battle has drained her family’s financial resources. On Saturday, December 8, Green Hill will host a HUGE yard sale here at the church to benefit her family. Thanks to everyone’s generosity, an entire storage unit of items has been collected! Many of the items are new, or nearly new, and everything is priced to be an amazing deal. Come out and shop with us! You know you want to! If you have any items to donate, please contact the church office. On Sunday, January 27, Green Hill will host a Bone Marrow Registry Drive here at the church. If you are between the ages of 18 and 44, and in good health, there are patients who need you! Signing up to be on the registry is as simple as filling out some paperwork and getting a cheek swab. There have been massive improvements in the technology of bone marrow transplants over the years. For nearly 80% of donors, the process is lot like donating blood or platelets. If you can sign up to donate, please do. If you can’t, please help us get the word out about the drive. Everyone has the ability to save a life. The prayers and sympathy of the congregation are extended to the family of Al Brown who passed away on November 21, 2012. A HUGE thank you goes out to everyone who contributed to this year’s Thanksgiving Offering. It was a record year with $1,383 being collected for the Presbyterian Home for Children. The Home is a Christian caring community for children and families in need. Our offering will help them to continue this good work. The prayers and sympathy of the congregation are extended to the family of Joanne Lawrence who passed away on November 22, 2012. Mrs. Lawrence is the mother of Dr. Jim Lawrence. The happiest time of the year is upon us. Merry Christmas !!!!!!!!!!!!!. Our Bible Study will meet this month on December 13th. We will be studying Lesson 4 on The Word. Thank you for your donations to the Belks Charity Sale. We have received $145.00 from the ticket sales that will be used for our mission projects. A great big thank you goes to Gloria Webb and Nancy Smith for going to work that morning with me. This year your CT gave the $7.00 a box for the Blessing Boxes. Thanks to Sandi and girls for delivering them and the great pictures. A special thank you goes to Dianne McQueen for organizing the Thanksgiving Dinner and to all who helped make it so delicious. This was a special family time for all of us. The Presbyterian Children’s Home program was also a blessing. Karla did a very great job of keeping us informed. The CT agreed to try a service project this year. On Friday December 7th we will go to SARCOA in Dothan and help organize and sort the many gifts that will be coming in for the Santa for Seniors program. We will go at 11:00 am from church and after grabbing a bite to eat we will work from 12:30 to 3:00 pm. Then come home. So please give the gift you picked from the felt Christmas Tree for our SARCOA Senior before the 7th so we can take them over. She is a poor lady. Our Christmas Party will be Monday, December 10th at 6:00 pm in the Green Hill Fellowship Hall. Please bring a goody and a fun gift to exchange that evening. If you have not already made your Thank Offering please do so. The dead line to send it in is the first part of December. May God bless and keep us safe this holiday season. 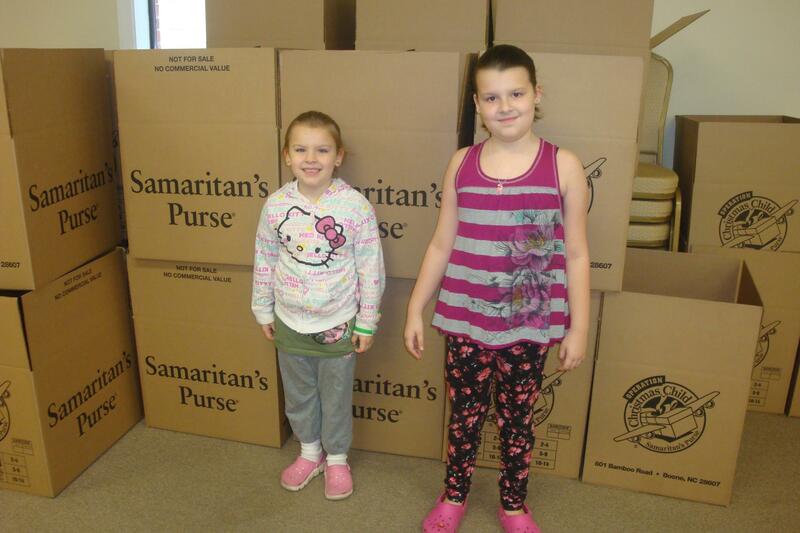 This year both the children’s Sunday School and Bible Club prepared boxes for the Operation Christmas Child project. Each box was filled with toys, school supplies, personal items, and other gifts. The boxes were delivered to Samaritan’s Purse who will ship them, along with hundreds of thousands of other boxes, to children in countries around the world. In addition to the boxes, the children will also receive booklets in their own language about the life of Jesus. Many will be given the opportunity to attend classes to learn more. Between our two groups at Green Hill, 34 boxes were donated. Who is sinless and pure.